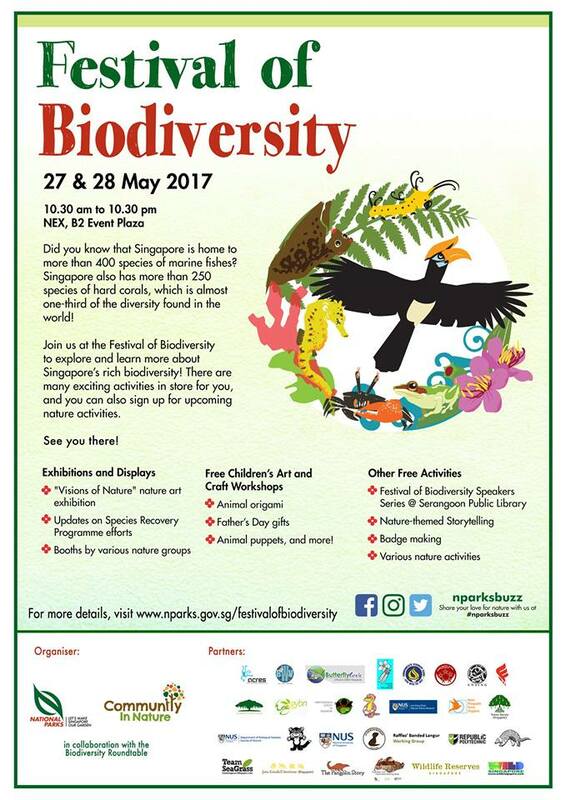 Butterflies of Singapore: Festival of Biodiversity 2017! ButterflyCircle @ Festival of Biodiversity 2017! 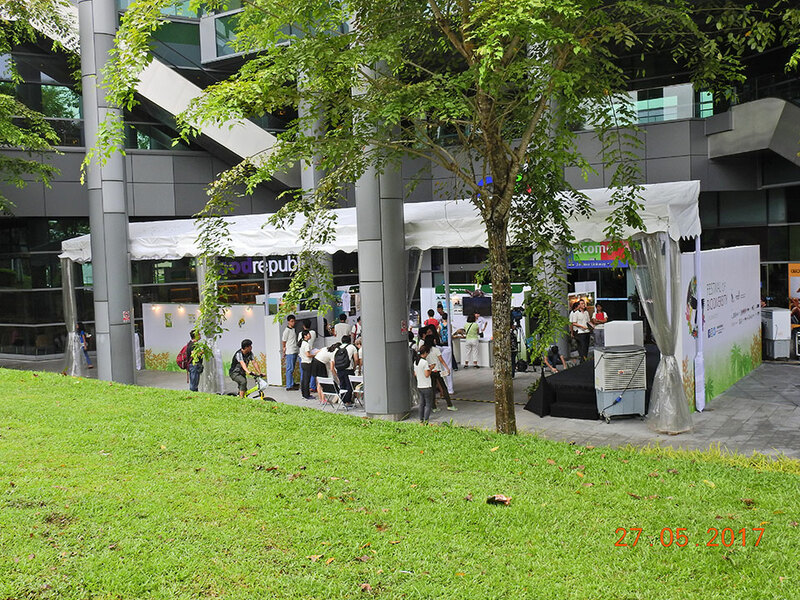 The Festival of Biodiversity is in its 6th run this year. 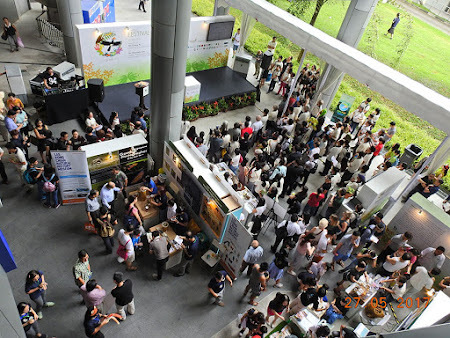 An annual event organised by the National Parks Board (NParks) Singapore, in collaboration with the Biodiversity Roundtable, the Festival aims to create awareness and foster a sense of appreciation for Singapore's natural heritage. 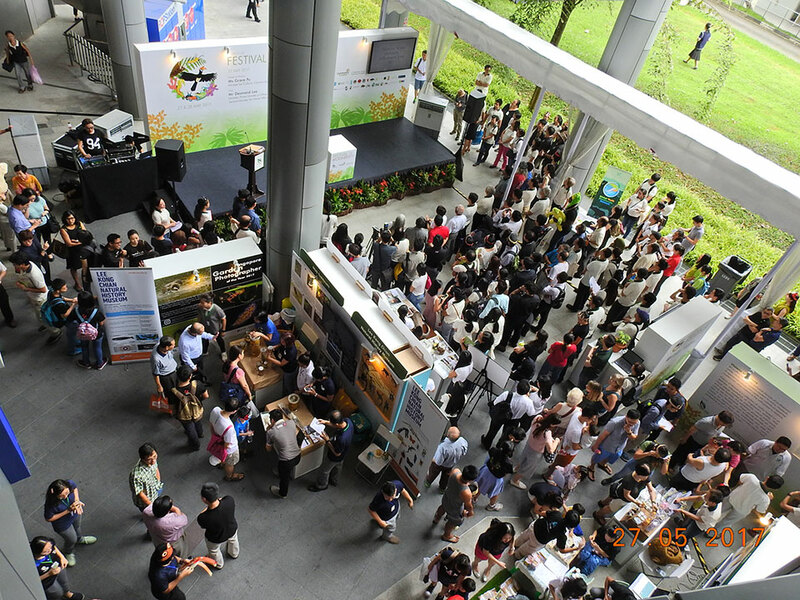 The festival showcases Singapore’s impressive and unique array of island biodiversity. 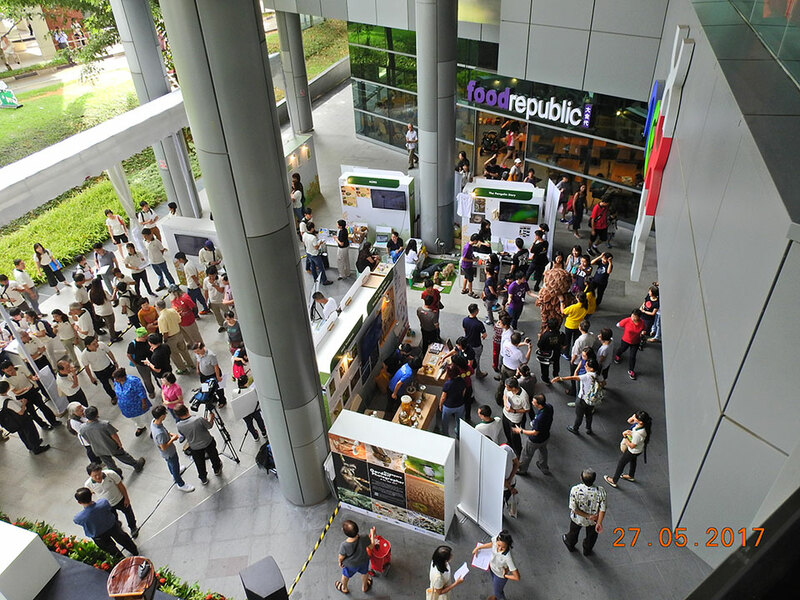 This event celebrates Singapore’s natural heritage and in doing so, hopes to bring about greater awareness of the rich biodiversity that Singapore has. After taking a break from having the Festival at an urban shopping mall, the FOB 2016 was held at the Singapore Botanic Gardens. This year, 2017, the FOB was moved back to a shopping mall! This time around, Nex Shopping Mall @ Serangoon was selected. The intention of hosting the Festival at shopping malls was to showcase Singapore's awesome biodiversity to the heartlanders and 'unconverted' residents of Singapore who may have otherwise not get the chance to see up-close, Singapore's natural heritage. This year, ButterflyCircle continued to support the FOB for the sixth time. 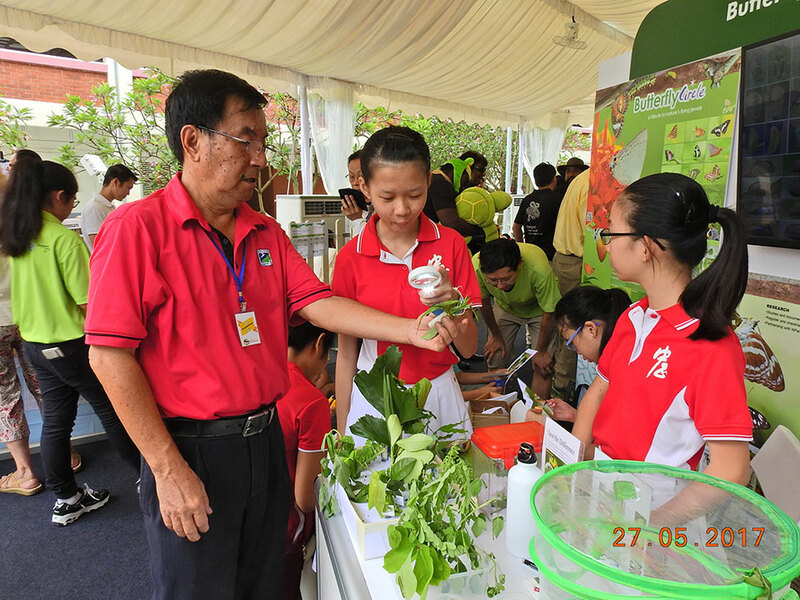 Members from the Nature @ Seletar Butterfly Garden and volunteers from Chung Cheng High School provided the much-needed reinforcements to man the butterfly conservation and education booth at FOB. As with the two previous years, Mr Foo JL brought in his awesome collection of live caterpillars to wow the visitors to the booth. We featured many caterpillar host plants and their respective butterfly species whose caterpillars feed on the plants. As our knowledge of the early stages of butterflies grow over the years, the information that is useful to parks managers and landscape designers has helped to enhance Singapore's butterfly biodiversity in our urban gardens. It is important to augment Singapore's "City in a Garden" reputation with our local fauna that animates our greenery and brings life to our gardens. ButterflyCircle's booth. Up and ready! As with previous FOBs, we started setting up ButterflyCircle's booth early on Saturday morning. 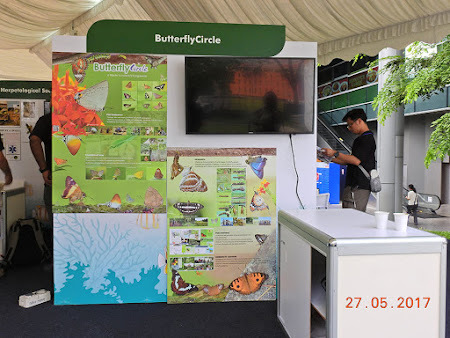 We put up the colourful display boards as our booth's backdrop, and fired up the video that featured our butterfly conservation objectives and showcasing butterflies. Mr Foo brought his 'babies' and plants and set them up with tender loving care. The live caterpillars are always a crowd pleaser, particularly with the children, whose curiosity and appetite for knowledge often throw us lots of questions. FOB17 was hosted by Minister Desmond Lee as with many previous FOBs. Minister Desmond is often seen as a champion of biodiversity and the environment. Indeed, he has won the respect and support of the green groups in Singapore for his tireless endeavours to conserve and protect the environment in his signature style of sincere and meaningful dialogue and balanced views. This year, we also had the Minister for Culture, Community and Youth, Ms Grace Fu, to grace the opening of FOB17. Nature groups were also pleasantly surprised by one of our 'pioneer generation Ministers' and one who cared for the conservation of our environment, Mr S Dhanabalan, who joined in this year's FOB festivities. Even after retirement, Mr Dhanabalan continued to lend his weight behind many conservation projects and support biodiversity enhancement projects. It was an honour to meet Mr Dhanabalan at the FOB17. 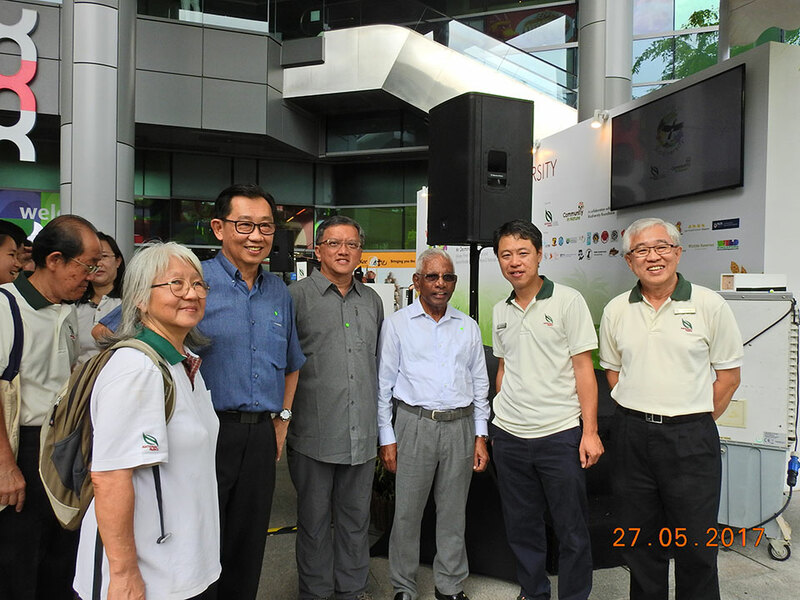 Minister Desmond Lee, in his speech, shared the initiatives on nature conservation and the discoveries that the volunteer community made during the various Bioblitz surveys in Singapore. He also spoke of the forthcoming projects that the government was implementing, as well as lauded the efforts of the nature community in Singapore. It was interesting to see a different group of visitors at the Nex Shopping Mall this year. The FOB was held at Vivo City Mall for three years in succession from 2013-2015, and it was a good idea to move to a different mall and attracting shoppers from a different part of Singapore to view the FOB exhibits this time. Over the two days, we were kept busy with many visitors to the booth and entertaining lots of curious questions about butterflies. Our volunteer teachers, students and members of ButterflyCircle and Nature @ Seletar groups helped to answer queries and share our knowledge about butterflies to the visitors. Our balloonist, Cheng Khim, delighted the visitors (particularly kids) with her colourful balloons in the form of flowers and butterflies. Cheng Khim and her balloon art entertained young and old alike! 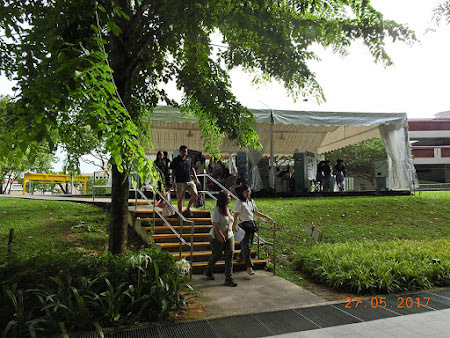 It was a tiring (and hot) weekend as the group did our best to educate the visitors about butterflies in Singapore, and what they can do to help with butterfly conservation. But to our volunteers, it was a meaningful time to spend and I could see the boundless enthusiasm and energy with which they shared their passion and love for butterflies to the community. Special thanks to teachers Jo Teo and Noor Sarah and the students of Chung Cheng (Main) for volunteering their time and effort at the booth, to Rita Dumais Sim, Vina Hermanto, Soh Kam Yung and son, Vanessa Lee, Rachel Lee, Eugene Koh, Mei Hwang, Lydia Davina Yeo and Chen Yimin for helping to engage the crowd. CJ for her design of the panels and producing the ButterflyCircle video, BC members Bob Cheong, Koh CH, Loh MY, Siaomouse and Nikita for their presence, and our balloonist Cheng Khim for her colourful creations. And of course to our guru Mr Foo for bringing caterpillars and plants to entertain the crowd.